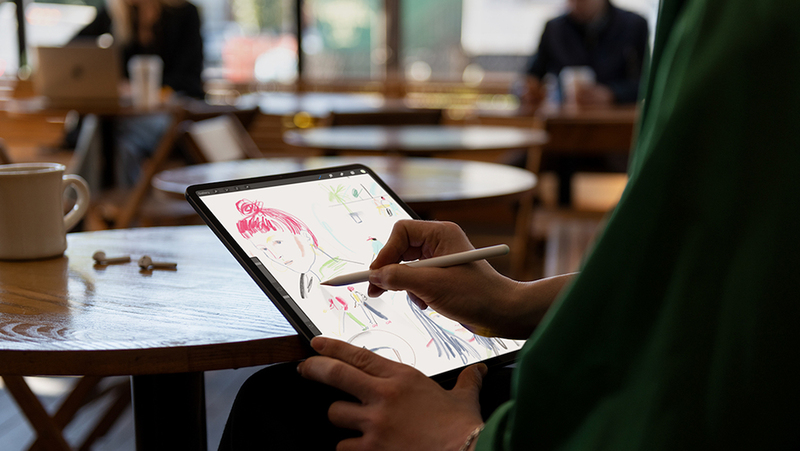 Apple today revealed the all-new iPad Pro, with an edge-to-edge LCD "Liquid Retina" display, slimmer bezels, no Home Button, Face ID, and a magnetic attachment support for the new Apple Pencil. The new 11-inch iPad Pro has the same footprint as the previous 10.5-inch iPad Pro, but now with a bigger display thanks to the slimmer bezels. The 12.9-inch version is actually smaller than the previous 12.9-inch model but with the same screen size. 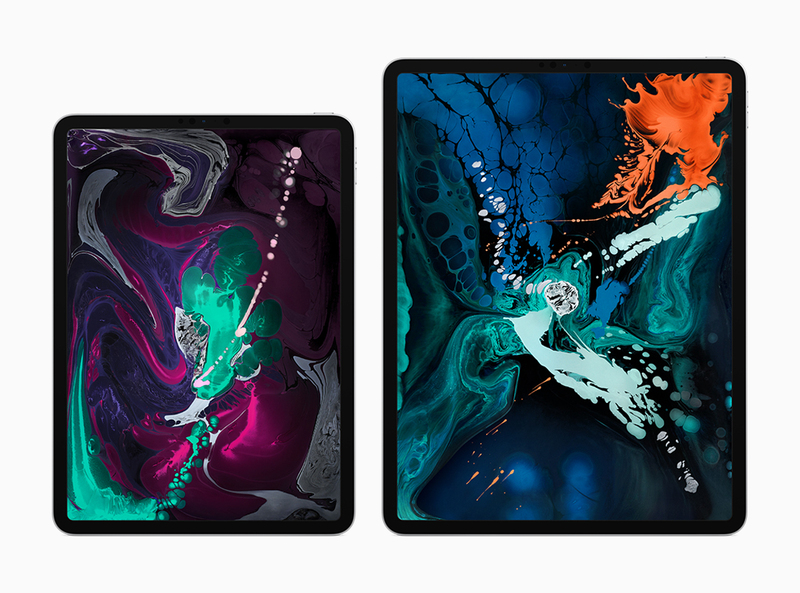 Apple put the same Liquid Retina display in the iPad Pro as the one found in the iPhone XR, using rounded corners that follow the curves of the iPad Pro's unibody enclosure. Apple says the display is its brightest and most color accurate iPad display yet, with wide color support, True Tone, and anti-reflective coating that provides a natural and accurate viewing experience inside and outside. Both models are 5.9mm thin -- "the thinnest iPad design ever" -- and the 12.9-inch version has seen a total 25 percent reduction in overall volume. Powering the iPad Pro is a new A12X Bionic chip, which Apple says is its smartest and most powerful tablet chip yet. A12X Bionic has eight total cores (four performance cores and four efficiency cores) that provide up to 35 percent faster single-core performance. There's also a seven-core GPU to deliver up to twice the graphics performance, fueling new AR experiences and console-quality graphics. During the keynote, Apple compared gaming performance on the new iPad Pros to that of the Xbox One S.
iPad Pro comes with Apple's next-generation Neural Engine for advanced machine learning in everything from photography, AR, and Face ID. 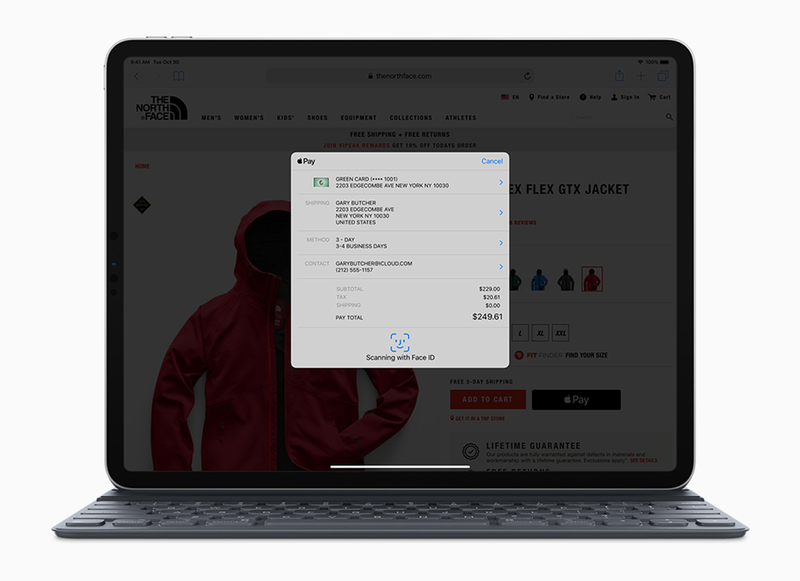 This marks the first time that Face ID is available outside of an iPhone, and on iPad Pro it's designed to work while holding the tablet in any position or even while seated and attached to the new Smart Keyboard Folio. Like on iPhone X and newer, Face ID uses the TrueDepth camera system to map and recognize your face and securely unlock iPad Pro, pay with Apple Pay, access secure apps, and more. You'll also now be able to create and interact with Animoji and Memoji on iPad Pro using the front-facing TrueDepth camera. Throughout all of these features and daily use cases, Apple says iPad Pro has a 10-hour battery life. The tablets also have a new USB-C connector that is replacing the old Lightning connector, offering users the chance to charge an iPhone while on-the-go, transfer data between devices, and drive external displays up to 5K. The 11-inch and 12.9-inch are available in Silver and Space Gray in 64GB, 256GB, 512GB, and a new 1TB option. 11-inch models start at $799 (Wi-Fi) and $949 (Wi-Fi + Cellular), while 12.9-inch models start at $999 (Wi-Fi) and $1,149 (Wi-Fi + Cellular). You can pre-order the new iPad Pro, Apple Pencil ($129), and Smart Keyboard Folio ($179 11-inch and $199 12.9-inch) today on Apple.com, and they will launch on Wednesday, November 7. 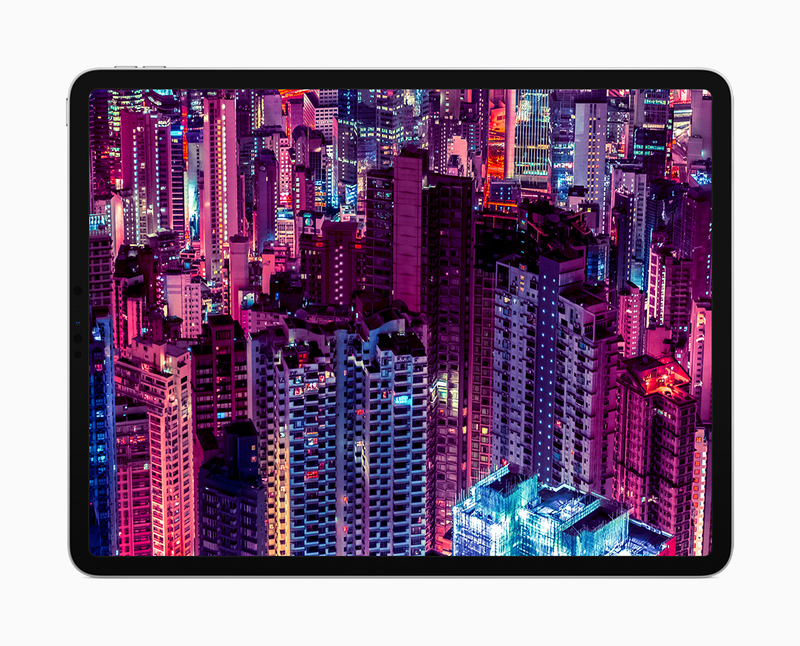 Apple is also launching a new Smart Folio for iPad Pro in a protective, polyurethane folio design that will be available in a variety of colors for $79 (11-inch) and $99 (12.9-inch). Countries where the iPad Pro will be available at launch include: the U.S., Australia, Austria, Belgium, Bulgaria, Canada, China, Croatia, Czech Republic, Denmark, Estonia, Finland, France, Germany, Hong Kong, Hungary, Iceland, Ireland, Isle of Man, Italy, Japan, Jersey, Latvia, Lithuania, Luxembourg, Macau, Monaco, Netherlands, New Zealand, Norway, Poland, Portugal, Puerto Rico, Romania, Singapore, Slovakia, Slovenia, Spain, Sweden, Switzerland, the UAE and U.K.
Later this year, the new iPad Pro models will be available in Colombia, Greece, Greenland, Guatemala, India, Israel, Liechtenstein, Malaysia, Macedonia, Mexico, Morocco, Peru, Qatar, Russia, Thailand, Turkey, Saudi Arabia and South Africa. Still limited by iOS. All that toast and no jelly. Working on a 3GB PSD file, then throwing into AR in front of 1000's, Worldwide audience on the web - HOPING the app won't crash. I'd be a nervous mess also. She did well. Schiller - "It goes edge to edge"
its a big stage for someone who hasn't done this before. They knocked it out of the park on these iPads. USB-C is almost surely coming to 2019 iPhones. Remember when the iPad Pro started at $599? Remember when gas was under $2 a gallon? Yeah! And I'm never going to buy a Lexus without an engine hand-crank. wanted to see an OLED Ipad.